On average, as a B2B marketing leader, you are spending roughly 25% of your marketing budget on events, and that number is likely climbing as customer experience and engagement emerge as critical drivers of acquisition and retention. Before you order the swag and begin stocking the hospitality suite, though, it’s important to take a step back to ensure your go-to-market plan and relevant dynamics are guiding your strategy. Facing increased competition? The right speaking engagement can help distinguish you as a thought leader, so be sure to secure one and get your prospects there. Launching a new product? Well, you’ll want to build pipeline for it, and events can be an efficient way to do this. Entering a new segment or vertical? Brand awareness may be the priority, so amp up presence around your events. Or maybe use industry shows to learn from potential buyers, securing space for pre-scheduled meetings with them. Event types vary and so do their price tags, so value for money is a critical KPI as you select, forecast and track performance – because predicting and committing to the outcome of each event, regardless of how elaborate or simple, will be a good litmus test of achieving repeatable ROI. Owned or ‘hosted’ events afford complete control of attendees, venue and message, and can create community in your market, which helps establish your company as an industry leader. Owned events can range in scale from large user conferences, to breakfast roundtables, to more intimate gatherings planned in coordination with industry and regional events. If your plan calls for a sizable customer expansion or migration number, owned events can be a good investment. More targeted ‘VIP’ and regional meetings are a nice complement to their broader strategy and are ideal for pipeline creation and deal acceleration. Edison 10X winner, Billtrust, as an example, hosts customers, prospects and partners in the triple digits on an annual basis at their summit event, which focuses on product education, community and creating upsell opportunities. Since inception, this event has consistently delivered 25%-30% of the customer expansion pipeline target for the quarter in which the event takes place. Sponsorships require participating companies to help finance an event in exchange for brand exposure and/or introductions. If you’re in a highly competitive market or new to a sector and brand awareness is your focus, sponsored events are a worthy consideration. ItemMaster, for example, sponsors industry events to build brand, connect and reinforce their market position with top-tier enterprise accounts. As such, they are able to attribute a 45% lift in pipeline velocity to such sponsorships. Whatever the sponsorship package, do what you can to give it a boost by finagling a speaking slot and/or some other PR benefit and/or some form of organized meeting-making. And, make sure your sponsorship package includes access to the attendee list weeks in advance (so SDRs can get to work pre-setting prospect meetings). Exhibition opportunities (pod, booth, tabletop, etc.) are often, though not always, offered in conjunction with event sponsorship. Event sponsorship can be required to exhibit, or, more typically, you can secure a booth at a lower price. Exhibits are a great way to build awareness and get your message out to a broad audience. That said, in order for exhibiting to be a smart investment, you want to focus on driving highly qualified traffic (read: ICP) to the booth. Emplify exhibits at events and, during 2017, was able to credit them for influencing a whopping 40% of new bookings. Lastly, target relevant speakers, press and known attendees to set meetings at the booth in advance. You might also offer to qualified targets the chance to win a compelling prize. Co-marketing and co-hosting events with partners can be effective in reaching a shared ICP without incurring the costs associated with a 100% owned event. They’re often held as micro-events at or around larger conferences. Invest in this type of event if you have a partner growth plan or referral program in place, and if there is strong synergy between your and your partner’s value propositions. The best scenarios for these events are those where both parties have aligned objectives, shared accounts and opportunity to leverage each other for introductions and pipeline creation. As an example, partner events are core to Sigstr’s marketing strategy. Their All ‘Bout Margaritas parties are hosted with partners at industry events, and have generated 100% more leads than exhibiting alone. Events are an opportunity to connect with (qualified) masses to increase your brand exposure and create demand. Be creative and have fun with your event campaign themes, but be mindful of finding a formula that delivers repeatable (dare I say, predictable?) ROI. Set objectives and KPIs for each event, using historical data like number of attendees, meetings secured and leads to pipe as a baseline. The key is to orchestrate a balanced strategy and established discipline for how they are budgeted and executed. 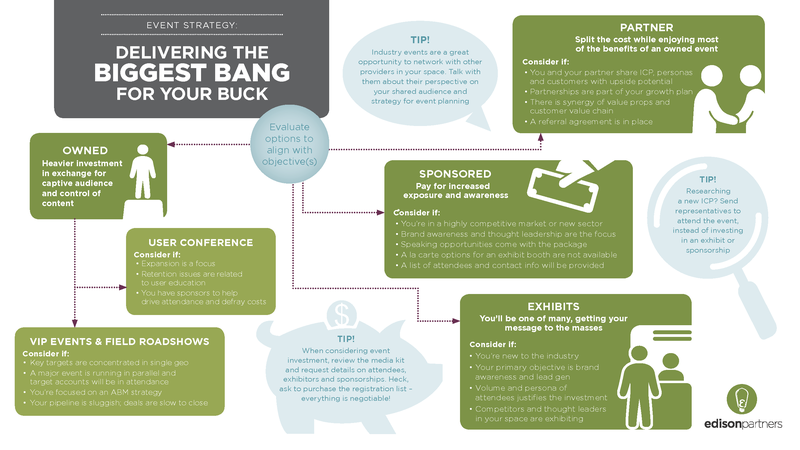 Download our infographic to help you think about your event strategy for 2019. This is the first blog of a three-part series. Watch for the next installment: Event Tactics that Drive ROI.